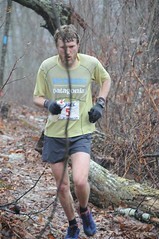 Rock/Creek’s Race Team continues to bring home the glory in ultramarathons across the Southeast this winter. Husband and wife team members Jamie Dial and Wendi Parker-Dial took first place in the mens’ and womens’ divisions, respectively. Jamie’s time broke the course record by 20 minutes. Another husband and wife pair from the team fared well: Matt Sims placed 5th and his wife Natalie placed 5th female. Kathy Johns finished 9th female. Great job guys! The course is really amazing and has a good mix of terrain. Though rarely “flat”, it does have some dirt road sections that give your brain a slight reprieve from the single track rollers. I loved seeing the state park signs below Blue Hell that say STEEP TRAIL AHEAD. There were other signs that probably said keep children close or something, but I had tunnel vision at that point and only remember STEEP TRAIL…. Get in on the discussion here (forum requires signup to post, but it’s free, so please come join us! ).